It was a December-2007 morning at Toyota's Bangkok Plant where a group of 27 Senior Managers from the Power Sector Multinational ABB from its various Asian-Australian Plants were waiting in the Reception area. They were eagerly looking forward to the Plant Tour of this great company which was a part of their one week Session on Lean Management concepts. There came an HR Personnel at the reception area to this group and introduced them to a young girl possibly aged 23-24 years who was supposed to be their Tour Guide for the Plant Tour. This indeed was something unexpected for this group who were expecting a Senior Management Personnel from Toyota to come as the Tour Guide. I being one of the members of this ABB Managers Group later on discussed this with one Toyota employee and found out that this is their normal practice to have any employee to get involve as Tour Guide once they have completed the induction of Toyota Production Systems(TPS) working for Toyota for 2 years at least. It was something which we were not used to see often in our Plants as well as other places. Meeting & guiding external people has been considered as a privileged job of Senior Management Personnel only. So this was the first lesson we learnt of Empowerment at Toyota even before the real Plant Tour began for us !! 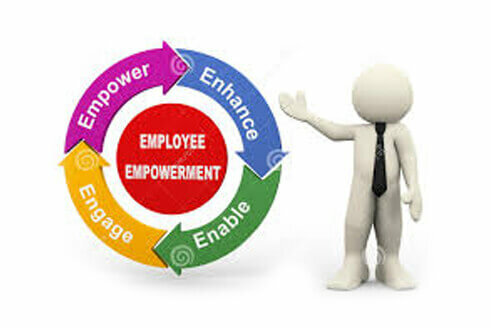 Employees Empowerment - is that one of the topics of management where there is lot of discussions happened already but comparatively less work done on ground reality ; which provides a huge opportunity for every manager to understand and utilize this concept fully in their own area to unleash greater success in every aspects of their work.There is hardly any doubt to me about the tremendous potential of this simple looking concept which is moreover untapped !!! Employee Empowerment – is a strategy & philosophy that enables employees to make decisions about their job, own their work & take responsibility for the results of their own decisions/actions. ASQ (American Society for Quality) defines Employee Empowerment as : "To provide employees with the means for making influential decisions"
Job Enlargement : Changing the scope of the job to include a greater portion of the horizontal process. An Operator who is working on an assembly line if asked to conduct self-inspection of the process step which he/she has performed with an authority to pass it on to the next process stage. Job Enrichment : Increasing the depth of the job to include responsibilities that have been traditionally carried out at higher levels of organization. For instance - a Machine Shop Operator getting involved in the Planning process along with the Planners to help schedule the component to his/her next internal customer in the value chain. This is the first key to empowerment which ties them all together. By replacing the old hierarchy with self-managed teams, more responsibility is placed upon these unique and selfmanaged teams. Plant in terms of 5S Implementation within one & half years' time. Give a thought to this and identify all potential areas where you have an opportunity to empower people in your organization. They could be empowered to become 5S Team Leaders, they could become Internal Trainers , Quality Circles working on Customer Complaints resolution, teams working upon autonomous maintenance of machines & equipments, manufacturing planning & scheduling core groups, QMS & OHS Auditors Panel, etc. The list can be endless depending upon the degree of empowerment one wants to achieve. Ensuring crystal clear objective for their employees - is the primary responsibility of a manager – which may although seem a trivial thing to mention ; but not done effectively in most cases.It is worth doing as - more the clarity , more are the chances of achieving it. It is better to communicate this over & over again rather than leaving it on the employee to let them figure this out on their own. Setting up measurable goals is one thing. Writing them down is another. And having specific, deadlined action items towards reaching them is yet another…and this is where communication plays a vital role from a leader's perspective. This is the most important key to empowering people within an organization. By sharing information with everyone, one gives them a clear big picture of the company and its current situation. This fosters trust; by allowing all of the employees to view the company information, it helps to build that trust between employer and employee. Give them access to those information's needed to perform the new task effectively. Give them the required exposure by sending them to participate in an external Seminar/ Convention where they can present their Project along with other professionals from other organizations. There is no greater learning opportunity for the employees to represent their organization in such an event which in itself is a kind of recognition for their significant work also. I understood this better when that young girl with hardly 2 to 3 years working experience with Toyota was answering almost every question from our people on that day. She was so well informed about each & every aspect of the organization that she faced no difficulty whatsoever to answer any of our queries ranging between total sales figures to number of KAIZENs trend - during the Plant Tour. As W. Edward Deming says : "Training is not compulsory ; neither is survival.." Training is one of the most important aspects in the empowerment process. It is an ongoing process & should be seen as an investment in future rather than a cost. While working on the Training Process one should ensure two important things :(a) the employee who is trained once comes back to from the training session should share his/her learning's with the concerned members of the remaining team. (b) There must be a focussed approach to develop some internal trainers also – as it is in itself a very important display of empowerment in training process. One need to coach the empowered teams consistently. The coaching could be short term or long term depending upon the task ahead for which you are preparing them. One will need to monitor how they progress , whether on right track or not, whether they are in need of any kind of resources, etc. Two things one should never forget in Coaching the team members : (a) Try to become a Role Model himself which others can follow. Preaching something without following it himself – will never work ! (b) Take personal & genuine interest in one's team member's development. Help them identify their strengths , weaknesses & opportunities. Help them to set goals for themselves. "Never tell people how to do things. Tell them what to do and they will surprise you with their ingenuity." --General George Smith Patton, Jr. This is a temptation hard to avoid for a manager. I have seen Senior Managers falling for this mistake of explaining their team members the "how" part with so much of detailing ; more often but comparatively less focus on the "what" part of the objective ; which definitely does not help to build shared vision among team. Keep on communicating the "what" part along with "why" it is so important to achieve that objective for the organization and what value it carries for the same. While dealing with the problems resolution always pin point the process and not the people ! Without a well structured and well thought of Reward & Recognition System to compliment one's Empowerment Efforts – it is absolutely not possible to get success in engaging their people. Reward & Recognition need not be monetary benefits always. One can do brainstorming among his Executive Management Team and find out few unique ways to appreciate the work done by team members. It could be (but not limited to) following : a badge showing appreciation , a word of appreciation within a group gathering, a movie/dinner coupon, asking a team to present their improvement project in a communication meeting , asking them to become one of the shop guides during an important visit from a Senior Executive, etc. It needs a lot of thoughtfulness & innovation indeed ! I have once tried one innovative idea like calling 3 top 5S Winners to take lunch with the business leader of the location where they can describe & explain their success factors to the leader. On another instance , we have once taken our Global Operational Excellence Manager to see one KAIZEN completed on Shop Floor by an employee recently. You can not imagine the look on that employee's face as the Senior Executive from Switzerland was taking genuine interest in his KAIZEN project asking related questions on how it was done , how he got this idea ; and so on. Probably no financial reward would have matched the positive impact of this small interactions which he had with this Senior Executive. From a leadership perspective , a manager has to consistently demonstrate that he/she values his/her people. There could be possibly no better reward & recognition for a person than having his/her leader showing genuine appreciation for his/her unique identity , significant work done by them & skills they have. Jack Welch rates "Employee Engagement" as the first one among the top 3 key factors he believes to be monitored consistently in order to see how the business is going on – along with other two being Cash Flow and Customer Satisfaction .He says – "It goes without saying that no company, small or large, can win over the long run without energized employees who believe in the mission and understand how to achieve it. That's why you need to take the measure of employee engagement at least once a year through anonymous surveys in which people feel completely there are safe to speak their minds." There are many other indicators also to see whether one's empowerment efforts are effective or not. Such as number of suggestions trend, KAIZEN Blitz trend, 5S Index monthly trend, machine breakdown trend, Accident trend from OHS perspective, etc. Without a good review mechanism in place for your overall empowerment initiatives , it is very obvious to lose track and consistency in approach. This is one of those areas where Leadership has highest impact on the success (or failure) of the empowerment process. "Dealing with people is probably the biggest problem you face, especially if you are in business. Yes , and that is also true if you are a housewife, architect or engineer. Research done under the auspices of the Carnegie Foundation for the Advancement of Teaching uncovered a most important and significant fact – a fact later confirmed by additional studies made at the Carnegie Institute of Technology. These investigations revealed that even in such technical lines as engineering, about 15 percent of one's financial success is due to one's technical knowledge and about 85 percent is due to one's skills in human engineering..."
The observation made by Carnegie above although is many decades old ; but holds true even today and is timeless in terms of its relevance for the management world forever. There is a tremendous untapped potential lying within each one of us as well as our team members and empowerment is one of the right strategies to bring that out and channelize it systematically for organizational growth. The Leader in You - Dale Carnegie & Associates , Inc. Stuart R. Levine, CEO & Michael A. Crom ,VP. The 3 keys to Empowerment - Ken Blanchard, John P.Carlos, Alan Randolph.